Poussin du Ciel's review (This content has been automatically translated from French)" Excellent synth"
Very easy to use as long as you spend a little time. Contains some sounds but the most interesting is to make them yourself. Sounds not at all realistic hand bells can be, but it is not the goal. It must be used for fifteen years. Bought used in 2000 by my mother FRCS a cash converter, I fell in love from the first time I saw him. Excellent quality / price in my opinion. I would do this choice with experience. vincemal's review (This content has been automatically translated from French)" A must have if you are brave"
2) The least expensive but more restrictive solution download the excellent PCJX8P on your computer and connect it via midi synth. Down with the cliché JX-8P = patches, it would be an insult to the JX-8P and its many opportunities. For my part I managed to make good lead sounds, bass, and even a bad imitation of a pan flute, which is still very enjoyable to play and listen for what it is. The presets are ... equal to themselves, they are shared between poor imitations of instrument (requires 80's ..), and synthetic sounds more or less true, but somewhat lacking in body and power, to desire to return to work then. Well I'm a little bad language, y 'to some that I use but it's up to you to make your own opinion on it. Some sounds are famous, it's true ... the preset "Stab Brass" in "The Final Countdown" and so on. Use the JX-8P is less recognized, but which for me is certain, the Reuse friendly preset "Music Box" from "Screw" by The Cure. The aftertouch adds a little more friendly, for sure ..
For the time value for money is excellent opportunity if you get a sum of between € 200 and 300, beyond that, it's too expensive, so for more than € 300 I think prefer the JX10 ... unless the PG-800 is included in the price. J'eu a Roland D-20 before and it is day and night, although can also have fun with it. This choice I would do without hesitation, in my opinion the most affordable analog that makes sense. The characteristics on AudioFanzine is nothing more to add. ct heuuu the programming is hard! without the PG800 galR hello! Fortunately, alternatives exist such as the freeware PC-JX8P that simulates a PG800 via midi ... has arranged things well! implantation noon is also UNESCORecords so that we have trouble believing that one is in front of an old synth from 1985. - Ground: not bad but I confess I have not found much prefers transcendant.je groundwater numriques my JD800. - Low: It seems that this is not his strong point, love me! with the filter wide open and in "unison" was a hit bad! Welcome to the 80s! That's just 2 days I mien.achet a misra in perfect condition I am almost ashamed (89). I love dj.il has his paw and sound blends beautifully with my Jd800. Guaranteed return in the 80's! sr although it is not absolutely versatile and some are still single categories between sons.il UNESCORecords destiny is a set. The JX-8P is not perfect, but it's also what makes it charme.Si you have the chance to go see one for not too much Do not hesitate, even without his contr PG800 has their worth. .6 The 1985 synth-voice polyphony. 2 oscilloscope by voice, making a total of 12 oscilloscope. Keyboard 61 notes, velocity and aftertouch sensitive. Very good location south, for the time: IN / OUT / THRU. Memory of 64 sounds, all editable! (Create your own sounds). The sounds are not realistic, but it is not what is asked. It is a perfect synth for modern electronic music, or even the environment. For being polyphonic, it allows the achievement of very beautiful tablecloths, large and warm. The sound is the highlight of this synth: the Anloga hot and alive. I've had four, five years. What I love most: beautiful tablecloths that can be created with, and that it is MIDI, which allows the use of "old sounds" with the controls today. What I like least: The fact that the publication by several faders simultaneously is only possible with the PG800 controller, optional. 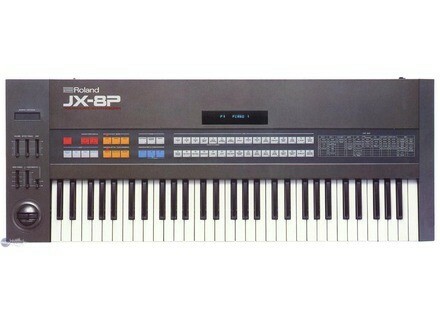 I have many other analog synths, and I used very often in this JX8P. Given its current argus (around 300 Euros), I think he redeemed without hésitation.Je worth over 1500 Euros to its release in 1985! Synth Ideal for those seeking a real good synth for cheap (make sure the fader EDIT function properly, I saw several JX8P or it stopped working. That's it, I finally have my JX8P! I jou on this keyboard about 10 years ago, a group of girl lunel and I ador tjr sounds of this keyboard! I come to find me a not too expensive! but exlent! guaranteed return in the 80's! sounds are really hot and analog, it's great and I'm changing my Triton keyboard .... quite simple, summary functions and effective sounds big, but enough basic connectivity, in short everything that is fo! Like all good old 80's synth, editing is a mess! So I provides a super editor to facilitate the pc it right, the rest It also gives me to load all the sounds Roma's existing bank! seen that the keyboard and the like relatively simple with the editor, it's gato! I have some cleaning machines to do, change any key and the bend, two three small adjustment, netoyer contactors and after key is to the ball! I'm like a new n with his new t tine! will I keep my collection of old nails, it's really the best!! The keyboard touch is not great, it is still there even DYNAMIC TCP and aftertouch (the common era), but the force is badly restored, it is better to order it from a keyboard master to assay the dynamic ... I collect will be used as a master keyboard for an expander! 8 note polyphony (the standard era) but analog and midi .... short, it is not so common a good analogue, polyphonic, dynamic, program and MIDI. Monotimbral against it by (one's time, a single midi channel ...), so it's simple trs. The edition of the sounds is very easy (I learned it), you just need some notion of analog synthesis. Moreover, it is necessary because the 32 internal sounds are rather void. Trs is limited (no external sound from a few modulations ...) but the filters are missing as to why the synths DCNI follows. A single sound but what a sound! The keyboard is not trrible, and it blows a little. Over time, the contacts under the keyboard and aftertouch rpond oxidize less. Found on the web an illustrated guide "step by step" for remdier this problem. I use it for a year, is the only analog that I had and I like it a lot. Aesthetics, it is quite impressive and plutt robust, with a nice 80's look (buttons membranes fawn color "Dictates magic" memory like a game cartridge for Atari video, LCD screen on the green like old calculators ...). As noted Previous notice, the machine tends unwind. Regarding the touch, it seems really Exceeds over Calvier type "synthquot; latest issue, I would not recommend it as a keyboard matre. Nanmoins, if you want a good analog, MIDI is more, and you can dpenser 300 euros max, take no hsiter. Unlike what some say, even without the PG800 was worth it, because the freeware PCJX8P replaces. In any case, the hybrid analog synth / MIDI is well worth some analog modlisations latest issue. Some notes are also sometimes tend paste. If I now discovering, I would do without this choice hsiter.